Oh, he's already free? Never mind. IT WAS HARD to miss, splashed recently across a full page of The New York Review of Books: an advertisement featuring the boldface words, "Dangerous times demand courageous voices. Bob Avakian is such a voice." Wrapped around those words, Talmud-page-style, were, to the left, a short essay about the importance of Avakian's "compelling approach to Marxism" and, to the right, a list of dozens of signatories, including academic superstars like Cornel West, performers like Rickie Lee Jones and Chuck D., and activists like Cindy Sheehan. Many of the men and women who signed the ad are respectable scholars - the list also includes Harvard's Brad Epps and Timothy Patrick McCarthy - and I knew it was not possible that they were all actually devoted to Avakian. In fact the ad is lukewarm, at best, on the man's actual politics: "While those of us signing this statement do not necessarily agree with all of [Avakian's] views," the ad says, "we have come away from encounters with Avakian provoked and enriched in our own thinking." Curious, I began to call around. The first few signatories I tried to reach, including West and Michael Eric Dyson, a prominent African-American studies scholar at Georgetown, did not return my calls or e-mails. Rickie Lee Jones's management company promised to pass along my number, but I never heard from her. But as I reached others, it became clear that what Avakian represents to them, more than his role as one of the last true believers in revolutionary Maoism, is the ideal of truly free speech. For the past 25 years Avakian has been ostentatiously underground, whereabouts unknown, his followers insisting that the political climate is too dangerous for so brilliant a critic of America to show his face publicly. The ad plants a stake in the ground on precisely this issue: "We are also serving notice to this government that we intend to defend his right to freely advocate and organize for his views," it reads. Epps, a Spanish professor, sent an e-mail confirming that this is why he lent his name to the ad. "My support has more to do with freedom of speech than any substantive ideological adherence," he wrote. McCarthy, a historian, said that he signed the ad to show his support for free speech, adding, "If my signing the statement is in any way taken as supporting the views of Bob Avakian, I would reject that." In the age of the Patriot Act, in the aftermath of a war caused partly by the quiescent media's fear of asking hard questions, liberal and left-thinkers have naturally been quick to defend anybody's free speech. As well they should. And if this is the person whom so many have chosen to rally around - even though nobody seemed ready to defend Avakian's actual views - then, I figured, he must be quite a remarkable figure. So I resolved to meet the man himself: Chairman Avakian. As it happened, I had an idea where to start. When I used to live nearby, I would sometimes kill time by browsing in the Revolution Books in Cambridge. I enjoyed leafing through the pamphlets by Mao, listening to the cashier explain to curious patrons how Deng Xiaoping was a sellout. The small stock always included several shelves devoted to the works of Bob Avakian. It was a name I hadn't thought of in years until I saw the New York Review ad. The store was now upstairs, having moved when streetside rents got too high. It still had the dusty works by obscure presses, and the books by lefty heroes like Howard Zinn and Noam Chomsky. I asked the new cashier, a serious fellow with an old-school Boston accent named Ben O'Leary, where I could find Bob Avakian. "It's not something that's going to get discussed," O'Leary said, ominously. "I'm not saying whether I know or not," O'Leary said. So I bought a copy of Avakian's autobiography, "From Ike to Mao and Beyond," and left. Taking O'Leary's advice, I called the number that I found on the website of the Revolutionary Communist Party, USA, and left a message for Carl Dix, the national spokesman. The next day, I got a call back from a Los Angeles talk-radio host, Michael Slate. Dix was not available, Slate said, but instead Slate could speak about Avakian, whose views he "wholeheartedly" supported. "So did you help write the ad?" I asked. "I wasn't in the core of putting the ad together," Slate said. "Can you tell me who was?" "Have you met Bob Avakian?" "I would object to that question. It has nothing to do with the article." I turned to Google, looking for someone who might be able to help. I quickly discovered that Scott McLemee, a critic, essayist, and blogger, had written extensively on Avakian. Once, for an article that never came to pass, he spent months trying to score a meeting with the chairman. "I wanted to sit down with the guy," McLemee told me on the phone, "and see what Chairman Bob seems like in person. We had meetings which led to meetings which led to meetings. I was told to come to New York, we would have a meeting, I'd be told one way or the other if we could have a meeting or not. McLemee, who had paid his own way to New York for the meeting, was incensed. "And I was ready to be driven around in the back of a van for eight hours just to meet Bob Avakian," he said. "What are they scared of?" I asked McLemee. "There's a real fear there for his safety, which if you saw Malcolm killed and King killed, might be understandable. Except Chairman Bob [is] about as much threat to the US government as my grandmother." In "From Ike to Mao and Beyond" (2005), Avakian tells the riveting story of a middle-class California boy who moved left during the '60s, first in the Free Speech Movement and Students for a Democratic Society at Berkeley, then with the Black Panthers, and finally into the far-left Maoism of the party he founded in 1975. In 1979 Avakian was arrested at a demonstration against Deng Xiaoping's visit to the White House; charged with assaulting a police officer, he fled the United States for France. His autobiography contains a picture of a bearded Avakian, wearing a Che-like beret, gazing solemnly at the camera, the caption reading: "[t]he author in exile, in front of the Wall of Communards in Paris, 1981." And so he remains in exile, a man persecuted in his own land. Except he isn't. 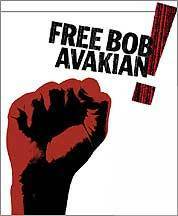 All charges against Bob Avakian were dropped in 1982, as he admits in his book. But the chairman is still on the run, even if nobody is chasing him. There is a fine line between paranoia and narcissism, and some people live on both sides of it. As the chairman slips further into obscurity, the Revolutionary Communist Party, USA, has become ever more clearly a cult of personality focused on him. And the move is not subtle: in "Meaningful Revolutionary Work," an essay posted in early January on the party's website, Avakian writes, "One important aspect of boldly spreading revolution and communism everywhere is the work of building what we have characterized as a culture of appreciation, promotion, and popularization around the leadership, the body of work and the method and approach of Bob Avakian." As one man who for decades has been close to the party told me, "That word 'culture of appreciation' is their word for 'cult of personality."' And Avakian has admitted as much. Once asked by a college radio station if the party was developing a "cult of personality" around Bob Avakian, he replied, "I certainly hope so. We've been working very hard to create one." The party members are right about one thing, though it's not something they'll admit: Avakian is more of a threat in hiding than visible. The cult of personality would be more difficult to maintain if Avakian were giving speeches, having to answer questions from reporters, or - worse - never being asked questions by reporters. What if Bob Avakian threw a revolution and no one came? The followers of Bob Avakian want to believe that their chairman is important enough to be hunted. Because if the only people looking for Bob Avakian are Scott McLemee and me, then he hasn't had much of an impact on the world. Which means, too, that if the mainstream left is hitching its free-speech cart to a mule like Bob Avakian, it has even bigger problems. "It does make you wonder about the acumen, shall we say, of those who sign on," said Todd Gitlin, the sociologist and former president of Students for a Democratic Society, who knew Avakian slightly in the late '60s. "This is a marker of the ludicrous feebleness of the unreconstructed left." Those who don't agree with Avakian but signed the ad anyway think that voices like his are being suppressed. And some surely are. "Quite frankly," Slate, the LA radio host told me, "we live in an era of Norman Finkelstein, we live in an era of Ward Churchill, we live in an era of Joseph Massad" - academics whose careers have been threatened in part because of their controversial views. But perhaps such real cases are insufficient rallying cries, even for the oppressed themselves. No one was more certain of Avakian's silencing than Churchill, the former University of Colorado professor who was much attacked for writing in 2001 that "the little Eichmanns" in the World Trade Center were not innocent in their own deaths. I wrote an e-mail to Churchill, who signed the Avakian ad, suggesting that nobody was conspiring to deprive Avakian of the right to speak. He replied, in part, "I mean, you can't possibly be that naive, can you?" The petition-signing left has many reasons for enabling Bob Avakian's personal mythology. He's a living link to the '60s, an era when American campus radicalism reached its apogee of influence. And he was an outspoken atheist back in the day, too, before Christopher Hitchens and others found bestsellerdom in unbelief; one professor told me he admired Avakian's stand against religious fundamentalism. But above all the Avakian narrative allows civil libertarians to register a vote for free speech, even if they have to ignore the fact that Avakian's speech is in no danger of being suppressed. Rightly concerned about Guantanamo and the Patriot Act, they figure that Avakian is a good proxy fight, or good enough. As for party members, if they were being honest, their choices would be rather limited. Either they could believe, on scant evidence, that Avakian is being oppressed. Or else America, for all of its faults, isn't as dangerous or malevolent a place as they want to believe. Or, just maybe, America is that terrible, but has more dangerous people to target than Avakian. The journalist in me really wants to talk this over . . . with Bob Avakian. So Mr. Chairman, let's meet for lunch. You can tell me if I have it all wrong. Mark Oppenheimer is the author of "Thirteen and a Day: The Bar and Bat Mitzvah Across America" and editor of The New Haven Review.